Cirrus Plus Folding Power Wheelchair with Footrest and Batteries . The Folding Cirrus Plus EC 22" Power Chair by Drive Medical is foldable and lightweight making it ideal for transporting. It comes in an attractive, lightweight, carbon steel frame with a silver vein finish which is easy to maintain. This model has a double cross brace frame to support an increased weight capacity. This Power Chair comes standard with a seat belt, seat cushion with pouch for easy storage, swing away footrests with calf straps and heel loops, wheel locks and an adjustable tension, padded, back upholstery, adding to users convenience, safety and comfort. The integrated, programmable PG controller and adjustable length joystick mount accommodates most user sizes. The Cirrus Plus EC Folding Power Chair has been tested and surpassed the ANSI RESNA testing requirements, providing our consumers with added security. If you're looking for added product protection, purchase the additional warranty coverage by adding Drive Medical's Piece of Mind protection to your scooter. 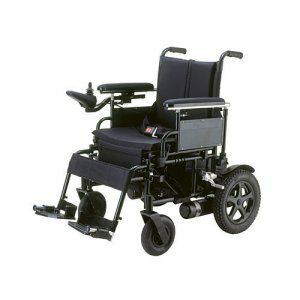 Drive Wheels: 12.5" Solid Tires; Caster Wheels: 8" Solid Articulating; Anti-Tip Wheels: 1.5" Solid; Max Speed: 5.0 mph; Ground Clearance: 4"; Turning Radius: 35"; Overall Width: 42.5"; Overall Length: 29"; Range: Up to 10 Miles; Seat Width: 22"; Seath Depth: 18"; Seat Height: 18"; Bakc Height Adjustable: 18"-22"; Arm Style: Adjustable Height; Footrests: 7.8" x 6"